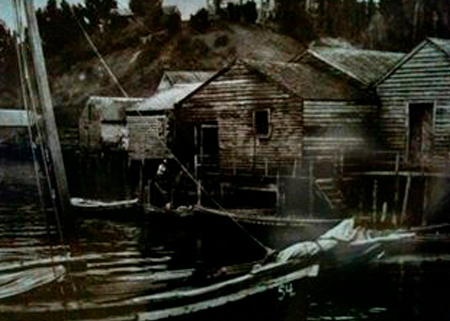 The history of Chiloe began with the appearance of the first human beings on the Chiloe territory over 5,000 years ago. Along the entire coast of the east side of the Big Island there were what in Spanish are called “conchales” which are deposits of mussel shells made by humans accompanied by rock tools and traces of bonfires. Occasionally marine birds skeletons are found, and every now and then human skeletons too. All of these traces demonstrate the presence of nomadic groups dedicated specifically to the recollection of seafood, fishing and secondarily to hunting. These archaeological sites were seriously damaged by the tsunami in 1960. The “chonos” are the first habitants known in the archipelago. The name represents one or various nomadic marine groups of low height who lived in Chiloe up on to the “Penas Golfo” which appear to have been related to other canoeist southern people like the “alacalufes” or “kawesqar”. They would sail among the ocean surrounding Chiloe and would cross the Corcovado Golfo up to the archipelagos of the Chonos and the Guaitecas in boats made out of three planks known as “dalcas”. Evidence of “conchales” show that they would remain in certain spots temporarily to protect themselves from the winds. They dedicated their work to the recollection of seafood and sea lion hunting. There is a hypothesis that says that the way “chonos” cooked their food was through hot rocks in a whole covered with “pangue” leaves, which would be the predecessor of what is currently known as “curanto”. They would dress with wolf skins and blankets made out of dog hair. The “chonos” were displaced to the south with the arrival of a sedentary group that came from the continent. This group was known as the “Huiliches” who were looking for a new place to stay possibly pushed by the “mapuches” who were coming from the north. The relationship between the “chonos” and the “huiliches” wasn’t always pacific though by the mids of the XVI century there had been both an ethnic and cultural mixture between both groups. Due to this mixture the chonos began to practice incipient agriculture, mainly of the potato, meanwhile the “huiliches” adopted marine costumes from the “chonos”, mainly the use of the “dalcas”. With the arrival of the Spanish the “chonos” moved towards more remote areas. The arrival of the Spanish conquerors to America happened in 1492. In 1950, the ship of Alonso de Camargo sighted the coasts of Chiloe while they were traveling to Peru. Years after, Pedro de Valdivia organized an expedition with the goal to recollect geographic information. He named the captain Francisco de Ulloa to be in charge of the expedition, who arrived to the Chacao Chanal in 1553 and toured the islands of the archipelago. He is considered as the first European to know Chiloe. In 1567 begins the process of conquest of the Island of Chiloe under orders of the governor Rodrigo de Quiroga. The one who was assigned to complete the task was his son in law, Martin Ruiz de Gamboa, who took with him 110 men equipped to settle in the new lands. They crossed the Chacao Chanal in four days using “dalcas”, taking many days because not only did they have to cross with their possessions but they also had to cross with their horses. 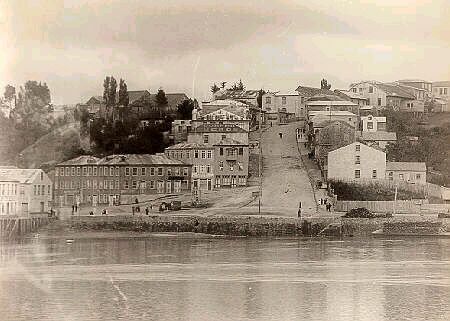 Ruiz de Gamboa considered appropriate to found a city besides the river which the natives named “Quilque” (current River Gamboa) and he baptized it “Santiago de Castro”, meanwhile the island was named “New Galicia”, though this name did not prosper and the “hiuliches” language preserved keeping the name Chiloe. After distributing the natives and establishing the necessary institutions, Ruiz de Gamboa returned to the continent to continue fighting in the “Arauco War”. During the XVII century the Chiloe habitants suffered repeated attacks from Dutch Pirates. The Spanish requested to depopulate the island due to the misery and isolation the habitants claimed to live, though this was never granted due to the strategic relevance this settlement had to Spain, in effect, Chiloe was known as “The Key to the Pacific”. During the first years the mercenaries and Franciscans were in charge of the evangelization. In 1608 the first Jesuits arrived, and in 1612 they founded the first church in Castro to evangelize the natives, to then continue to build more churches around the entire archipelago, most of them using the native system of work called “minga”; in effect by 1767 there were already 79 churches built and today you can find more then 150. After the expulsion of the Jesuits in 1767, the Franciscan Order assumed the religious assistance of the island. Following the independence of Chile, under the government of Bernardo O´Higgins, Lord Cochrane, after assaulting and taking over the city of Valdivia (1820) headed down towards Chiloe and assaulted the Castle of San Miguel of Agui, though he was rejected and defeated and had to return back to Chile. This first military success motivated the governor of Chiloe, Don Antonio Quintanilla to organize troops to defend the province, which maintained faithful to the Spanish monarchy, by this they were able to defeat another Chilean expedition, directed by the Supreme Director Ramón Freire in the battle of “Mocopulli” on April 1st of 1824. Two years later Chile organized an expeditionary army with the objective of annexing Chiloe, and this time through the battles on the lands of Pudeto and Bellavista on January 14th of 1826 and the retirement of the chiloen troops a truce was agreed. 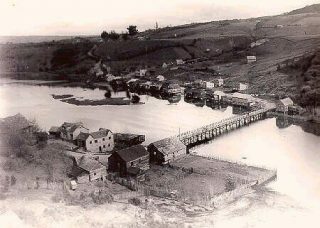 Finally a treaty was signed, “Tratado de Tantauco”, by the commissioners of both armies on the San Antonio bridge.